More Translations for Oracle Application Express? Joel Kallman, the Software Development Senior Manager for Oracle APEX has raised the question: Should Oracle Application Express be translated into other languages? Oracle Application Express (APEX) currently comes with built-in support for 10 languages. But that doesn’t mean that you can’t use it with other languages, too. You always have the possibility to translate the system generated messages into the language you want to use for your application. I think with the last release (3.0) all of this text strings are now translatable. If everybody is happy, why the question? Because the development environment will still appear in English (or any other supported language). For some people that is a problem and it also raises the barrier for the “Power Users”, Oracle APEX is also targeting. I think most of them want to work in there native language. Personally I have a different preference. Another drawback is that the wizard generated text strings (eg. for buttons, validation errors, …) are always generated in the language the development environment is running. So you always have to go through them and change them. Stupid work. That reminders me an OTN Forum thread where I discussed this with Scott Spadafore some time ago. The idea was that the wizards should not use the language of the Builder/Browser, instead it should use the Primary Language of the Application for all the text it generates. That would help a lot if you run the Builder in English, but you want to develop an application with Primary Language German. But back to the topic. What additional languages should Oracle APEX support? I am specifically interested in the market opportunity for Application Express, and not necessarily your personal preference. I think two languages could have a good market opportunity for APEX, especially because you see more and more people from this countries on the OTN APEX Forum. 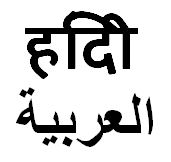 This languages cover countries with a growing economy and nearly 1 billion people (Hindi: 240�550 million, Arabic: 186-422 million). But do we need a full blown translation for all languages? For a lot of languages it would already help if the system messages and the wizard generated strings are translated. That are about 30-40 strings for each language. That’s a big difference to a full blown translation which has to go through the full translation cycle when the UI of the Builder is changed in a new version. I’m sure the APEX community is happy to contribute to provide this translations! Or even better, put them into a table which is modifiable. That would give the biggest flexibility. But that are just my thoughts about this topic. Now it’s time for you to participate in Joel’s one question survey so that he hears your voice! This entry was posted in Misc and tagged translation by Patrick Wolf. Bookmark the permalink.